Historically, the buildings in our portfolio were built with natural gas fired domestic hot water (DHW) boilers. Gas fired cogeneration (CHP) systems use engines that burn natural gas while simultaneously turning an electric generator. The waste heat given off by the engine is captured to produce domestic hot water, and the generator produces electricity that is fed back into the building to help reduce the power that would otherwise be needed to be purchased from the utility for the building systems. The overall efficiency of CHP systems are higher than regular boilers. Beach Green Dunes has a 10kWh CHP system installed as part of the mechanical system of the building. A similarly sized regular DHW boiler is also installed as a backup for when the CHP requires maintenance and/or repair, so the tenants will have uninterrupted hot water continuously. In addition, if the electric grid should happen to go down, the CHP system will continue to operate in an emergency generator mode to both supply designated circuits in the building while also continuing to provide DHW. At 42 Broad Street, a much larger 130kWh CHP system has been specified for incorporation into the project. 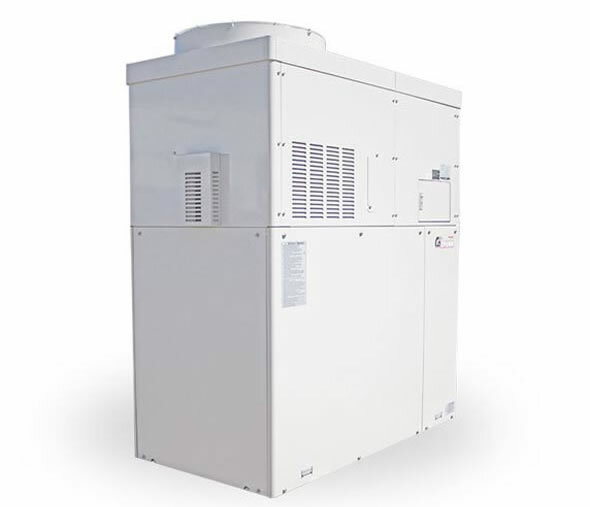 The system will use two 65 kWh CHP units. This will enable some level of redundancy for the operation of the building. If and when one unit needs to be shut off for service or repair, the other unit can continue to operate in order to satisfy most of the building’s DHW needs.